The S²E website has moved to http://s2e.systems. You will be redirected in 5 seconds. You are currently visiting the archived website for S²E 1.0. S²E is a platform for writing tools that analyze the properties and behavior of software systems. 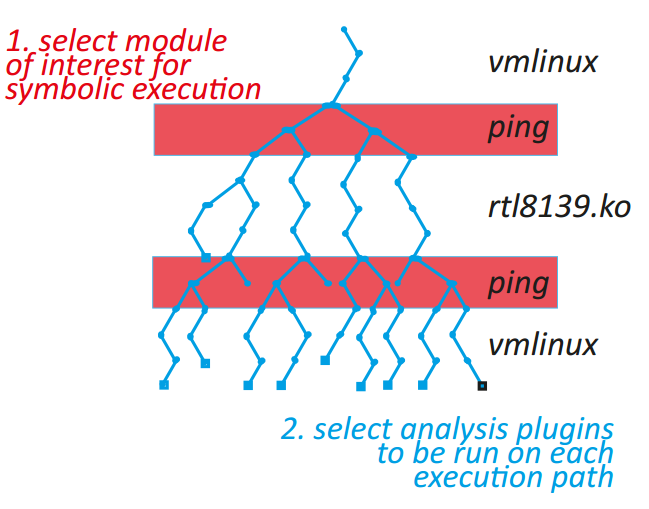 S²E is a virtual machine augmented with symbolic execution and modular path analyzers. S²E runs unmodified x86, x86-64, or ARM software stacks, including programs, libraries, the kernel, and drivers. Symbolic execution then automatically explores hundreds of thousands of paths through the system, while analyzers check that the desired properties hold on these paths and selectors focus path exploration on components of interest. We have used S²E to develop a comprehensive performance profiler, a reverse engineering tool for proprietary software, and a bug finding tool for both kernel-mode and user-mode binaries. Others have used S²E to build scalable file system checkers, symbolic execution engines for interpreted languages, tools for finding trojan messages in distributed systems, verifying software routers, testing embedded systems, and more. Conceptually, S²E is an automated path explorer with modular path analyzers: the explorer drives the target system down all execution paths of interest, while analyzers check properties of each such path (e.g., to look for bugs) or simply collect information (e.g., count page faults). Desired paths can be specified in multiple ways, and S²E users can either combine existing analyzers to build a custom analysis tool, or write new analyzers using the S²E API. S²E helps make analyses based on symbolic execution practical for large software that runs in real environments, without requiring explicit modeling of these environments.